The Anti-Corruption Commission (ACC) has arrested of Infrastructure and Housing Minister Developing Ronald Chitotela. Mr Chitotela, 47, has been arrested and charged with two counts of concealing property suspected of being proceeds of crime. ACC Assistant Public Relations Manager Dorothy Mwanza confirmed the arrest to ZNBC News in Lusaka. Ms Mwanza said this is contrary to Section 71 subsection one of the Forfeiture of Proceeds of Crime Act Number 19 of 2010. She said that details in the first count are that on unknown dates but between the July, 2016 and October 2018 in Lusaka District, Mr Chitotela did conceal a property namely plot number 148 of farm 50A situated in Makeni, Lusaka. Ms Mwanza said the property was disguised in the names of Diris Mukange property reasonably suspected of being proceeds of crime. She said that in the second count on dates unknown but between the July, 2016 and October 2018, the Minister did conceal a property namely the remaining extent of Subdivision A of lot 22183/M situated in Ibex Hill Lusaka. Ms Mwanza said that the property was also disguised in the name of Diris Mukange property reasonably suspected of being proceeds of crime. She said Mr Chitotela has since been released on Bond and will appear in court soon. Meanwhile Mr Chitotela who was accompanied by his lawyer did not answer questions from reporters. The Anti-Corruption Commission has today arrested the Minister of Infrastructure and Housing Honourable Ronald Chitotela. Property suspected of being proceeds of crime contrary to Section 71 subsection(1) of the Forfeiture of Proceeds of Crime Act Number 19 of 2010. Shameful. How can a nation really develop? Chitotela insulted a loved son of luapula, Harry kabala, luapula chiefs are not happy with him, that’s why bad things are happening to him. Thieving is finally being fought. Let us wait and see. Kindly gather them, Isolate them. Let it be a speedy trial. Move in and investigate all suspecious fellows even appointed charaters running publics offices and organizations. Corruption stinks. Corruption erodes public confidence. It returds development. No sacred cows. Investigate and prosecute. Ngati asurvivor, ni good luck. CK can’t go down alone. Chitotela is a pompous chap. I’ve seen the way he handles himself, even when he is in the company of the President he is rude even to the one who appointed him, the guy is just like Kambwili. Pompous and rude plus being a crook is a bad combination. Job well done we need to see more booted, they know themselves. Everyone in PF leadership has amassed wealth more their income. Chatotela is just a tip of iceberg, a sacrificial lamb. Serious PF looters have mansions in Joburg, swaziland, Dubai, Uganda & offshore forex bank accounts. When we say improve prison conditions and those in govt keep silent, this is what can happen. At least if the prisons where clean and not too congested aba mu ma yadi ba apamwamba teti ba tina sana ukwingila mu jele. Nomba as it is they know they are entering death camps where no one comes out the way they entered. If you are a broiler chicken used to shopping malls and air con luxury SUVs like The Cjitotela and Kambwili of thid world you won’t last 3 months. Bo Lubinda so called Justice Minister and Kampyango Home Affairs Head Boy guys improve both the judicial and penal system because the fruit always falls closer to the tree, and the fruit will rot under the tree. With Old Hen Inonge away in hospital …these chaps must have got hold of her medical sheet and concluded that the old hen will not be able to return to work so they are eliminating potential successors!! Mark my words ,this could be stage managed .The guy will be acquitted and the scumbags will start boasting about how independent the justice system is .It could also be a move to diverge people’s the attention Esther Lungu’s wasteful spending in America which has hit the internet. Why is he not fired like Kambwili who was dismissed on rumors? 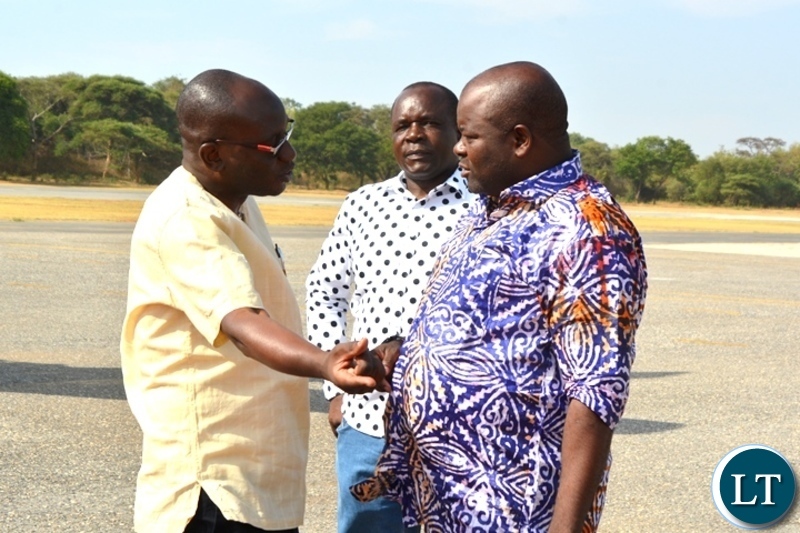 If president Lungu fails to fire Chitotela it is true he is scared of Kambwili. By the way how can anticorruption follow Chitotela and leave Kampyongo. They are all corrupt. But shame to SDA elder Chitotela. But I think this is a stint to show the outside world that PF under Lungu is cracking down on corruption. This will die a natural death and Chitotela will be free when Lungu sobers up. I believe this arrest has been sanctioned by Kaiser Zulu because Chitotela refused to pay protection money(about $150 000). This happened without Lungu s authorisation as Lungu is dead drunk to notice what has happened. When he sobers up tomorrow he will release Chitotela without a charge. Amapresidential ambitions have put chitotela at logger heads with Kaiser. PF is scum and must go. For being called “Your Excellency by his drivers”. Cage him and then cage them and finally, cage ‘him’ too. Wow wow. If something substatlntial comes of this and other culprits are also dealt with, Lungu will make quite a few points in my record book. We all know what happened to Mwanakatwe and Luo s cases of electoral violence and election rigging. At appeal stage all cases quashed. The same will happen to Chitotela. This us just a way to clear Chitotela of all petceuced corruption. Once Chitotela pays Kaiser the protection money all will disappear. Lungu has run out of ideas Instead of acting immidiatwly the public raises concern he decides to act when it’s too late and people have already branded PF as corrupt. Any responsible government should have dropped chitotela from a position of strength and power to pave way for meaningful investigations .This is what Lungu did to Mutembo Nchito .I wander what is different to Chitotela ? Lungu should not have one rule for Mtembo Nchito and another one for Chitotela otherwise this is just an animal farm . You are really gullible…this happened in 2016 and don’t you find it strange that a PF minister is arrested and ZNBC camera is outside…he must have just got greedy like the former ZAF commander and not given Lazy Lungu his cut. Who is lawyer for Chitotela, E.Lungu associates? This is shocking. ACC arresting a serving minister, sounds like Chitotela insulted his father. Maybe Brian also is just on the run with Zambia Airways expenses. True, Chapamo. Very different from the Levy years when Mmembe & Post were the accusers and judged people in public domain. A good step forward in institutionalising the fight against corruption. Very encouraging from ECL for allowing this.There is still time between now and 2021 to rid your government of the perception of high corruption. Hon. Chitotela also shifted the Government press to focus too much on development projects in his Luapula province giving people the impression that PF is only interested in developing Luapula. How can this be encouraging …what would be encouraging if ACC Director was not hand picked by Lazy Lungu. Ronald reduced the Bill of Quantities for KKIA construction from what it was originally planned for and scooping all the excess!! Its laughable we need to sort out our governance..this is 2019 and this issue may have happened in 2016. This is a first. A minister arrested!!!! Lets see what will happen. And you say President Lungu interferes with these institutions.Kambwili refused to to be investigated hence the President fires him.Here we are waiting for the report from ACC then the president will act accordingly. Old man Sata dropped then Labour Deputy Minister Ronald Chitotela and his Agriculture and Livestock counterpart Rodgers Mwewa for their alleged involvement in corrupt activities back in 2013. Speaking at a caucus meeting which preceded a Cabinet meeting at State House, Sata said he would not associate with anyone linked to corruption but we have foooooools here praising this Lazy Lungu who appointed this chap when they are still pending issues from 2013. I mean how do you appoint crooks even Maggie has issues on her but this Lazy thing Edgar still appointed her. But ACC are not mentioning why this property is suspected to be a proceed of Crime. Neither do they mention the suspected crime. What if Diris is a daughter, relative, mother, wife, friend and this was a genuine gift by the Minister. It does not constitute crime for a Mr Chitotela to register property in the name of a Diris Mukange in Zambia. The subject should be the crime (which has not been mentioned ) and not the concealment because it can easily be challenged. This is just a press statement. The man will appear in court and they will adduce evidence there. There is so much on this chap on specific contracts….am sure if they dug in on Lazy Lungu and all those ministers they would all be arrested. We hope this is genuine arrest if not sugar coating or just stage planned. Otherwise we would be glad if most of the Ministers are investigated because we are not getting better payslips for a take home. Ministers are eating well and we are suffering. Besides just too many ministers for small population scooping cash from the government at will. Maybe on this one Jona is working. Oh show evidence… Kikikikiki!!!!! What a disaster ba PF. Solveni. Do you mean Lazy Lungu …he was debarred by LAZ for defrauding a client. No some mole-rat sold our mines and is back trynna take some VIO of the land. He was debarred or whatever he’s now the Republican President fighting corruption. Thorn in the Flesh – Who sold your mines? Was this individual in govt? Do you FTJ? Really laughable …Infrastructure Minister in charge of inflated single sourced billion dollar road contracts arrested for concealment of lot number 148 of farm 50A situated in Makeni. …ACC can do better than that. The most corrupt one is fighting corruption by arresting his accomplices? Viva Lungu 2021, I think a lot of UPND supporters will shift to supporting Lungu if he champions the fight against corruption. Ck list is endless even Sunday chanda can receive red carpet in upendi. No traces of principles in the grouping. PF offloads rejectas, they welcome them with open hands. Guy, pa Upndead sure? Ine dead. Bubela. I can smell upnd in this.they are on chitotela,ch8talu, the aim is to make sure ecl has no support by 2021. Is it à crime for a minister to buy a farm for a family member on run a business using a relative if he can afford? Do have proof that he used .not. his? ECL open your eye before you remain alone. You must be from a specific province, or some kind of stoopid. He is a crook period, now Zambia’s ACC went to work. This is great news for the country. This is an example of dull thinking, i wonder what level of education you managed to attain. you may be the first to be arrested but really not the last one more to go. When are you going to arrest Chilufya for buying expired drugs and “placebo” drugs filled with starch manufactured by his Indian suppliers in Mumbai ….If ACC and Police were serious today all Lazy Lungu’s ministers would be gone Brian would be arrested for drink driving, Bowman would be arrested by ZRA, Maggie for stealing/ not paying back CEEC funds….there would no cabiinet meeting plus old hen Inonge is sick because of old age in India. This is great news for Zambia. No one should bring politics into this. Let Zambia’s great investigative wings and then the courts recoup the stolen resources. If and when Chitotela starts attacking the government and his party, all will be forgiven and he will become a hero In certain circles. Characters like Chitotela, Kambwili, GBM, Tayali, Brian Mushimba, etc are not worth being regarded as leadership material regardless of their party affiliation. It’s raining justice for the people. ACC please keep it up. But note we want you to actually prosecute them and win not long cases that go on for years only to go cold. Great stuff, we are pleased. Corrupt to the call, this guy. And what ACC has discovered is just a tip, much more is hidden. They should have shapulad him for 10 days, he was going to reveal more. Now with this Police bond he is going to do proper concealing that ACC will loose out. If the ACC worked independently, almost all the ministers would have been arrested by now. I suspect they had instructions for this one – considering that Chitotela appeared in an article not long ago where it was alleged that he had Presidential ambitions. ACC, Damn it, that thick boy CK mustn’t he be rotting in Jail already? These corruption charges that take moons away to be disposed of make me sick. There is no fast track? BUFFOON CK can never be locked up as he will not go down alone ..he will take Lazy with him that’s why he is walking free. We seem to be moving towards institutionalization of the fight àgainst corruption . The new financial law and the number of civil servants being arrested is encouraging. These have been stealing since the days of Kaunda. We had some artificial act under Levy. Most of chalala was built with stolen money. LUSAKA (Reuters) – Zambia’s infrastructure and housing minister has been charged with concealing property believed to have been bought with the proceeds of crime, the Anti-Corruption Commission (ACC) said. The ACC arrested Ronald Chitotela on Tuesday and released him on bail pending a court hearing. Chitotela did not immediately respond the Reuters’ attempts to contact him for comment. Transparency International Zambia welcomed Chitotela’s arrest. “We wish to use this occasion to encourage the ACC and all other law enforcement agencies to do their work without any fear or favour,” the anti-corruption campaign group said in a statement. been charged on two counts of concealing property acquired in an upscale residential area in the capital, bought with the proceeds of crime and registered in the name of another person. She gave no further details. If convicted, Chitotela faces a penalty of up to 5 years in prison. I strongly suspect it is not Chitotela alone. There could be some more Cabinet Ministers and senior government officials doing the same things. So if Chitotela has any sense of shame and guilt let him resign his position. Isn’t this the same Minister who was suspected to have had Royce Saili fired from RDA for exposing his corrupt deeds? Strong suspicions don’t stand in court. You have to have strong evidence that will prove beyond reasonable doubt. Once ACC prove their case in court, not in media, ECL shall sack Ronald. This ain’t going nowhere…for starters the case looks weak …..but he must have stolen bad…for a sitting in minister to be arrested??? First of its kind…. Meaning even his colleagues in his circles know what he has done. .just that he has outsmart them….they are jealous, that’s why they had to unleash the toothless ACC….not that the ACC did that on their own….the FIC report highlighted such but people decided to sweep things under the carpet….why now?? ?that’s the question we should be finding answers too….are you saying Chitotela is the only corrupt chap in government??? I doubt, many are those even those outside government but are linked to the powers that be have amassed unexplained wealth…. This is a tip of the iceberg. The man is a corruption guru! ACC ought to investigate the movement of cash on his busy account in the last FIC report. He must account for the monies which must be kick backs on the award of the contracts. The big cars (4x4s and Ranger Rovers that were driven out of his property) must be proceeds of corrupt activities. He may not want to go down alone and sing like a canary! Then the house will crumble like a pack of cards! There is one of the pillars, if not the pillar of the Luapula United biting the dust! Wither the “United”??? Well done Mr President. This is the beginning of scandal unveiling. Don’t be selective let every suspect go through the mill.This cancer of corruption must be fought vigorously. ECL this is the only way you will earn confidence and respect from Zambians when you open doors and allow investigative wings of government to do their job professionally. Development can never be attained when we have thieving leaders. It is like drawing water in a basket and expect it to be full. ECL you’ve a velvet grove, but there must be an iron fist in it. Use it and punch them hard. It is like arresting Al Capone on a minor traffic offence! The whole thing started when he refused to share the proceeds with the other girlfriend. She promised to destroy him. These are the results now. Don’t trust girlfriends. Kabiyenifye ku mahule. I do not understand the sensation about this guy’s arrest; he was earlier dropped by late President Sata because he and another were being investigated for corruption. I believe they were found guilty. Because Zambian leaders know how lax justice is, once given another opportunity to “serve” this guy continued “serving himself”. We need lessons that makes a guy never return to the table of privilege and leadership! Come on Zambians, you can do better! The clown grew too big headed that he could threaten other members of parliament with elimination by a special squad! Parliament is safe for his arrest. ACC should thoroughly investigate, prosecute and incarcerate him for a long time for stealing from the poor people of Zambia.